House of Cards will resume production early next year on a shortened Kevin Spacey–less season, Netflix content chief Ted Sarandos announced Monday. Speaking at the UBS Global Media and Communications Conference, Sarandos said the show’s sixth season — already announced as the final one — will run just eight episodes, down from the usual 13. 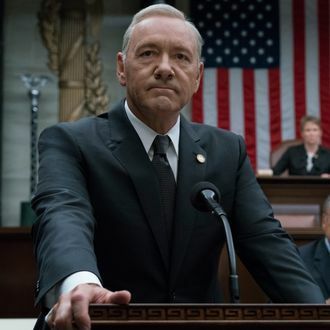 The show’s writers have been figuring out how to account for the absence of Spacey’s Frank Underwood character and the creative path forward without him. “We’re very excited we were able to come to a good creative conclusion to the show,” Sarandos told investors, noting Netflix wanted to figure out the right way to wrap the show up for both its fans and the hundreds of crew members involved in the production. It’s no surprise Spacey won’t be involved in Cards’ swan-song season: Following the revelations of sexual-assault charges against the actor, Netflix said last month it wouldn’t be involved with any production of the series involving him. What was left to determine was whether producers could make the show work without him, and how. No word yet on whether Cards will still return in 2018, though the reduction in the episode count should make it easier for producers to do so.